This is the 14k white gold version of one of the most popular rings on the market. Simple, classic, timeless, and an extraordinary value, this solitaire engagement ring will display your diamond beautifully and impress everyone who sees it. This ring can be set with a round, marquise, or pear shaped diamond. 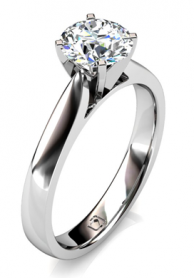 Simple solitaire engagement ring with a luxurious, contemporary feel that will please your budget. The arch in this 14k white gold setting separates the upper and lower parts of the band and elevates the diamond above everything else. 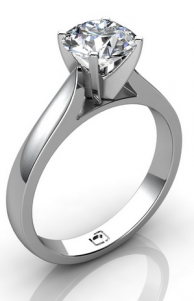 You can set this ring with almost any shape diamond, so get creative! Simply elegant, this solitaire engagement ring in 14k white gold is crafted to taper to a point and frame your center diamond in a four-prong design. Deriving beauty from simplicity, this wallet-friendly solitaire engagement ring has a 14k white gold band that tapers in at the very end as it lifts up slightly to accept your center diamond. The inner edges have also been rounded for maximum comfort while wearing. You can set this ring with a diamond of any size or shape. This 14k white gold solitaire engagement ring has a knife-edged band that creates a sleek, shining surface with simple sophistication that emphasizes your center diamond. This band is medium width and the setting can accommodate a diamond of any shape or size. Basic, simple engagement ring that will leave plenty of your budget for the diamond! The elegant "pinched shank" really looks great on this ring. Look at how it gradually tapers off towards the center diamond, giving it a flowing, consistent look. Quite nice! Versatile as well, this ring can be set with a diamond of any shape and size. This classic, simple solitaire engagement ring features a tulip-inspired setting to gracefully hold your center diamond. The band is made of 14k white gold, but the prongs are made of platinum for maximum durability. You can set a diamond of any shape in this ring (shown here with a marquise-cut diamond). 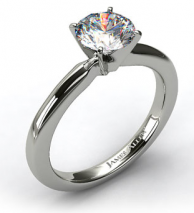 Classic solitaire engagement ring in 14k white gold. In addition, this ring has rounded inner edges for maximum comfort. Beautifully simple, this ring is also very budget-friendly and versatile as well -- set it with a diamond of any shape and size. This budget-friendly solitaire engagement ring has a 14k white gold band that splits apart at the very top as it accepts your center diamond. 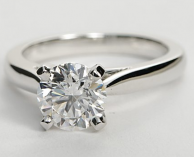 2 small "surprise" diamonds also provide additional sparkle on the sides of the prongs holding the center stone. This ring can be set with a round diamond up to 1.25 carats. The knife-edge band on this 18k white gold engagement ring creates a gleaming counter that focuses all attention on the center diamond, which is held by six prongs for maximum strength and security. This ring must be set with a round diamond. Floral leaf accents around the center diamond give this ring an elegant simplicity that brings smiles! 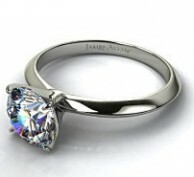 Beautiful ring if you want a setting with slightly more detail than a solitaire but nothing too complicated. 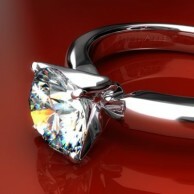 The prongs are elegantly shaped like leaves as they cradle and secure your center diamond in the 14k white gold band. This solitaire engagement ring can be set with a round diamond between .33 and 1.3 carats.